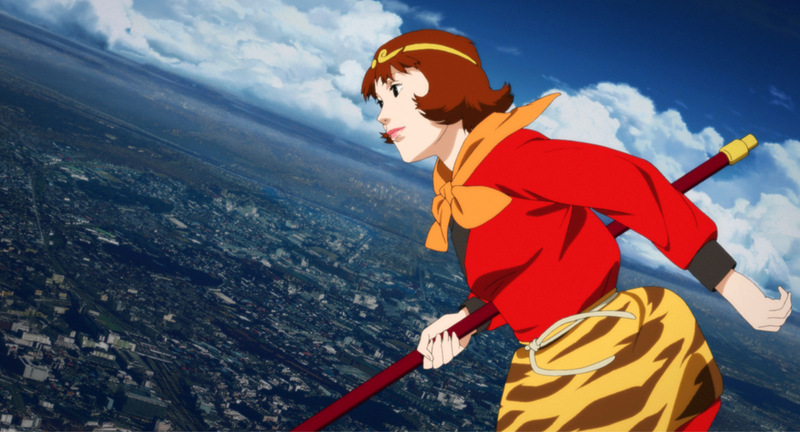 Paprika (2006, directed and co-written by Kon Satoshi) is possibly one of the strangest films I’ve ever seen. It’s a fascinating exploration of the nature of dreams (and in a related vein, the nature of film) wrapped up in simple thriller story of world-changing technology and its world-threatening misuse. At first these two sides of the film run parallel but separate, but soon they mix and the entire film is consumed (sometimes quite literally) by the crazed quality of dreams. The film revolves around a new corporate invention, the ‘DC Mini’ – a device that lets people view, record, and even enter other people’s dreams. This is framed as a revolutionary new tool for use in psychiatry and psychotherapy, and the film’s opening (one of the most startling, delightful openings of any film I’ve seen) sees the titular Paprika using the DC Mini to enter the dreams of detective Konakawa Toshimi to assess his psychological problems. What follows is a cold-water plunge into the film’s flawless recreation of dreams. Impossible acts and impossible architecture. Speeches that descend, at first almost imperceptibly, into insane, incoherent diatribes. Shifting forms and morphing faces. Parades of inanimate objects made animate. All that and more. But what defines dreams is so often not just the strangeness, or the impossibility of them, but the fact that this strange, disjointed madness makes so much instinctual sense when while they’re happening. And it’s here, more so even than in its beautiful portrayal of the impossible, that Paprika really shines. Not only do we experience the mad, impossible architecture of dreams, but we also experience the way dreams feel when we’re inside them. Around the halfway mark its plot descends into absolute madness, and even before then it’s already tearing itself apart. The sudden theft of the DC Mini allows an unknown thief to manipulate the dreams of others. After this it quickly becomes clear that this can even happen while the subject is awake, leading to dream-like delusions, or perhaps something else entirely. From this point on every moment of the film – whether waking or dreaming – becomes entirely malleable, and it’s this that allows Paprika to really capture the feeling of dreaming. 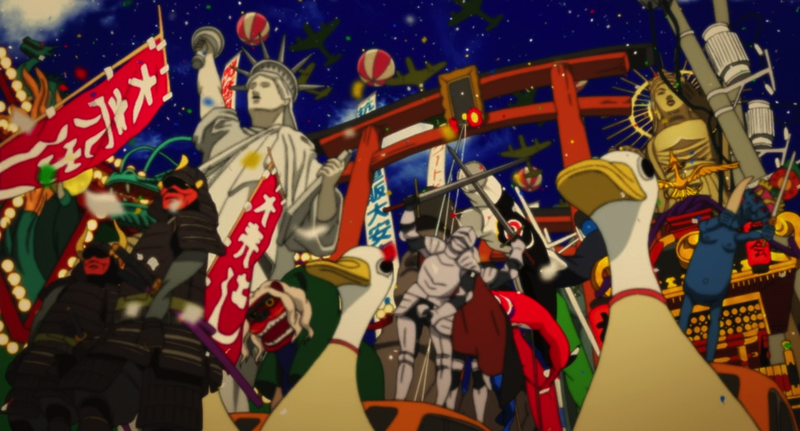 Countless things in Paprika, up to and including the entirety of the film’s climax, don’t really make sense if you stop and think about them., and in a lesser film, it’d be tempting to call these gaps and impossibilities plot holes, or narrative oversights. But it’s clear that that’s not what’s going on here. Paprika is a film whose narrative is about dreams, sure, but it’s also a film whose structure is about dreams; whose structure is dreamlike. It, as a whole, feels like a dream. It picks you up and carries you along and everything makes sense, or at least seems to. So, after the film descends into dreamlike madness nothing really makes sense, but everything makes sense. It smash cuts to some impossible sight and we go with it. The characters suddenly exclaim that they have to do something, or find someone, and we think ‘yeah’, even though, if we stop and think, we’ll realise we can’t explain why. Things don’t make sense when you try to rationalise them after the fact, but while they’re happening – while the film is going on – we understand everything on a strange, instinctual level. Oh, of course the dreams collided. Oh, of course she can fly now. Oh, of course going into Shima’s dream and inflating him until he literally bursts will wake him from his coma. Of course. Faces shift their form and torii gates walk. People burst out of the shells of others, like insects emerging from a chrysalid. These things strike you as mad and fascinating and brilliant. But while the individual sights seem strange, every turn and shift and incoherent direction the film goes in makes a kind of sense to the viewer while they’re watching, just as the senseless twists of a dream don’t arouse suspicion until you’ve already woken up. 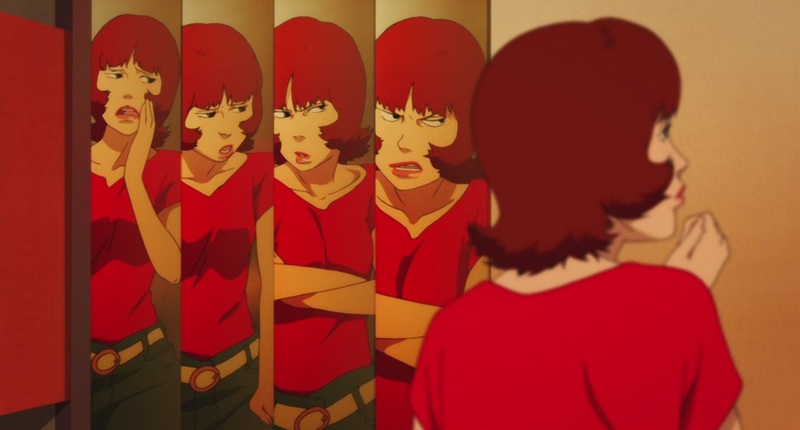 When Paprika finishes you find yourself unable to explain it, and when you try to think it falls just out of reach, but it was there, and you understood it in a way that even now, even minutes after, you don’t fully understand. 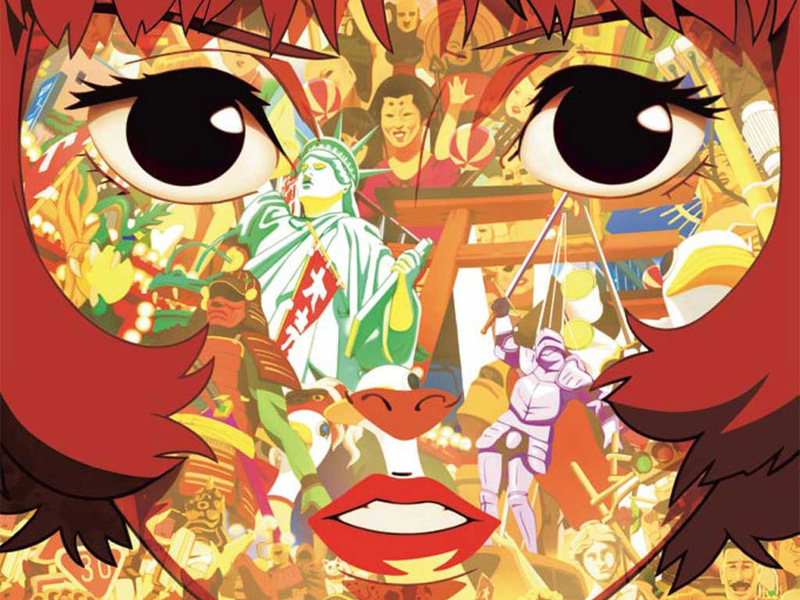 There are things that don’t make sense in Paprika not because the writers didn’t think them through well enough, but because the film isn’t interested in making perfect sense. Because dreams don’t make sense, and Paprika is more interested in feeling like a dream than anything else. No other film I know does this; marries the plot of the film with the way it’s constructed to create a film that feels like a dream. Take Inception for example. It’s arguably Paprika’s closest relative in the medium, and Christopher Nolan has stated that Inception was inspired in part by Paprika. Inception captures some of the strangeness and the impossibility of dreams, and its plot revolves around dreams, but only rarely does it feel explicitly dreamlike. It focuses on the architecture of dreams, but not the feeling of dreams. And the strange, impossible twistings of the plot leave us with gaps that feel like plot holes, like oversights, as a result. But Paprika is so immersed in the nature of dreams, the feeling and the qualia of dreams, that its impossibilities and incoherences don’t feel like mistakes. They feel like deliberate and vital decisions that allow the film to feel the way it does. Crucially, Paprika never feels like it’s just throwing crazy concepts at a wall to see what sticks. It nails down the feeling of dreams not by just being weird and crazy, but by being weird and crazy in exactly the right way. By looking at dreams and capturing, perfectly, the specific mix of feverish, indescribable madness that characterises so many of them. And by capturing the structural madness, rather than just the obvious madness of strange, impossible imagery. 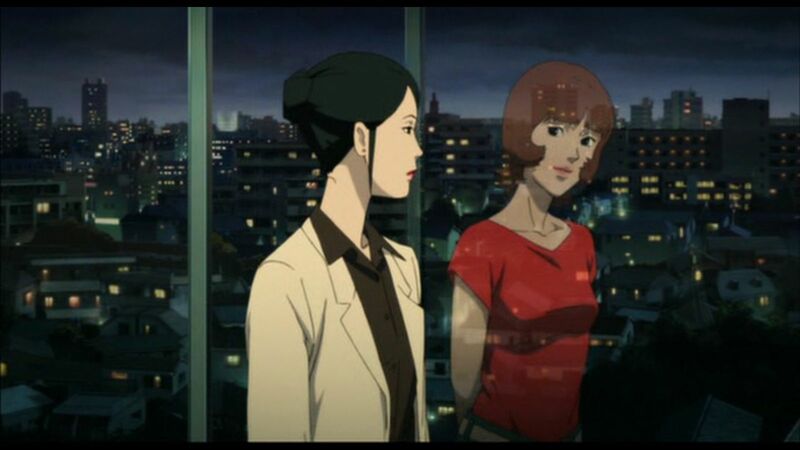 Nor is Paprika an arty film that creates oblique images and references for the sake of some opaque mystery. It’s carries you along as much by being fast, clever, and punchy (with incredible animation, and skilful use of editing) as it does by feeling dreamlike. It’s not just a film of grand ideas and high concepts, it’s a film of slick, masterful execution, from the art design to the animation, the sound, the voice acting, the editing, the screenwriting, the everything. It’s perfect, my god it’s perfect. 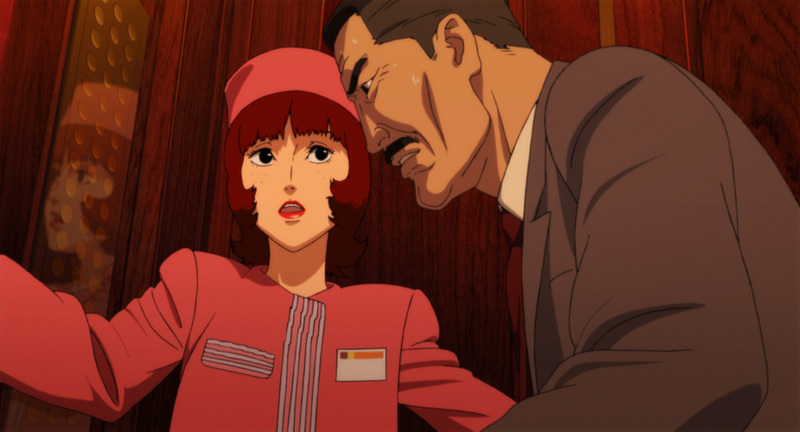 This entry was posted in Film Blather and tagged Kon Satoshi, Paprika. Bookmark the permalink.